Waiting, waiting, waiting. We are now 6 months behind our expected date for getting Title. An over optimistic estimate by the developer combined with a run of bad luck. 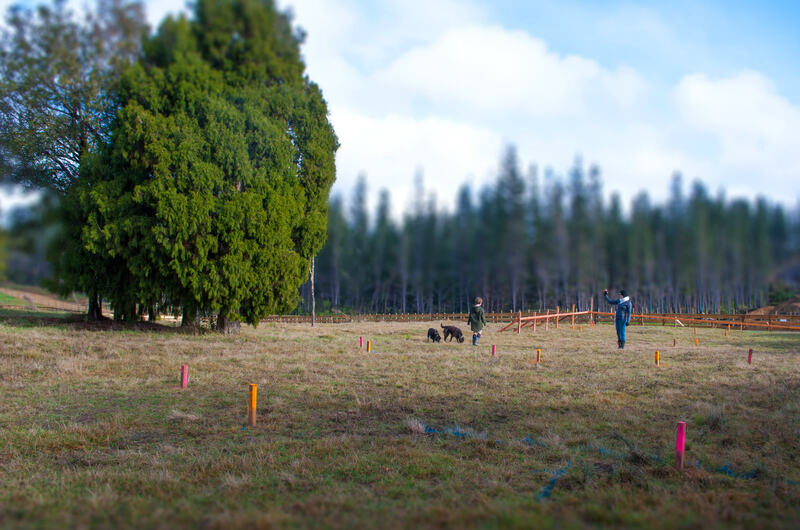 Or as we like to say…so far, we are behind time and over budget – so all is going as planned! The good news is that we have had plenty of time to research and consider what I can only call the bits and bobs. Tony has been determined to have a small but smart house. While slightly larger than we anticipated at 172 m2 (though all for very good reasons), we still hope to achieve a smart house. Do you remember when NZ used to be a test ground for innovation? Our small size made us an excellent place to pilot world firsts such as eftpos. Well, what happened?! Nowadays it feels more like we’re used as a dumping ground for 6-12 month old technology. So, we are now great producers of innovation (more on that later), but no longer the place to go to for experimentation. Subsequently cool things like the smartflower.com (all in one solar system) are light years away from being affordable here, and in the absence of subsidies, solar options are feeling uneconomic for the ordinary kiwi with power to the gate. Solar tubes for hot water heating were our first consideration, but if we are to harness the energy from the sun, then we are keen to really make the most of it. So we turned our search to Photovoltaics (PV). We appreciate that smart energy use is all about understanding how you consume power and responding accordingly, but at some point it is equally helpful to understand just how much something is going to cost to install, run, and what the return on investment is. When we finally got some answers to these questions, we felt that none of our options were realistic or compelling; not (a) a 10k to 16k upfront investment for on-grid option, (b) a full off-grid system starting from $30,000, nor (c) locking into a 20 year contract . In all fairness we did actually make an appointment with SolarCity with full intentions to go with PVs. Getting an appointment to talk to their “experts” meant a phone conference meeting to hear what they suggested we should get. After waiting weeks, the night finally came and then went with no call, apparently the “expert” (sales person) went home early and didn’t bother to call us. The days and weeks that followed was a bombardment of phone calls and emails from telemarketers working for SolarCity trying to rebook us into another meeting. The whole experience felt like a big sales pitch and left us feeling a little despondent, as all we wanted were some hard numbers and technical install information, instead it felt like a crazy pyramid scheme. This was just our experience, so don’t let this put you off trying for yourself. In the face of this and NZ’s largely renewable energy resources, we’ve decided to park PV for now. One day, when and if the price comes down, we will reconsider. Our second tech consideration was lighting. We love the sound of Philips Hue lights. These are of course LED but are more clever than just fancy light colour options. We have gone with the new Philips Hue white bulbs + the new Bridge 2.0 which runs up to 50 lights. These can be matched with the new Philips Hue wireless dimmer which is a nice touch, as you can connect up to 10 lights per dimmer, place the dimmer anywhere and also use it as a remote control if you can’t be bothered finding your phone. They also geofence your area, so when you get within a certain distance from home the lights turn on. You can also time them to turn on automatically if you’re away etc. Which leads us onto security. Up until this point security has never been a big consideration for us…in fact, I have been guilty of leaving the house only to return some hours later to find I forgot to close the front door, or one of the large sash windows was left wide open. But moving somewhere a little more remote means we are keen to get some security in place. I left the research of this to Tony, and he came across a Wellington company that’s playing with the big boys and leading innovation in global security: Cleverloop. There are now plenty of security camera options which connect through to your mobile phone, but what is also cool about The Cleverloop system is that it has the ability to learn (so the dogs don’t constantly set it off), 100% app based, wireless options, free cloud and local storage options, awesome support, and it’s Wellington based (did we mention that ….). We purchased the system and it arrived 4 hours later, awesome! and one which Tony was very keen to leave to me, is our septic system. Septic tanks are apparently a thing of the past. These days there are plenty of biological systems to choose from, where bugs (either microbial or worms) do all the dirty work and the rest of the water gets drip-fed out to irrigate your garden. Tony was not a fan of the concept of wormies dealing with our waste, so we started the search with microbial systems. There seem to be a few reputable options around, and on chatting with a supplier, he did boast that the worms were unreliable and shed skins essentially blocking up the system. If anyone has heard of worms shedding their skin, please let me know, as I couldn’t find any information on it. As we researched more, we decided to go with Natural Flow (also recommended by Trevor our Envirohomes hero). 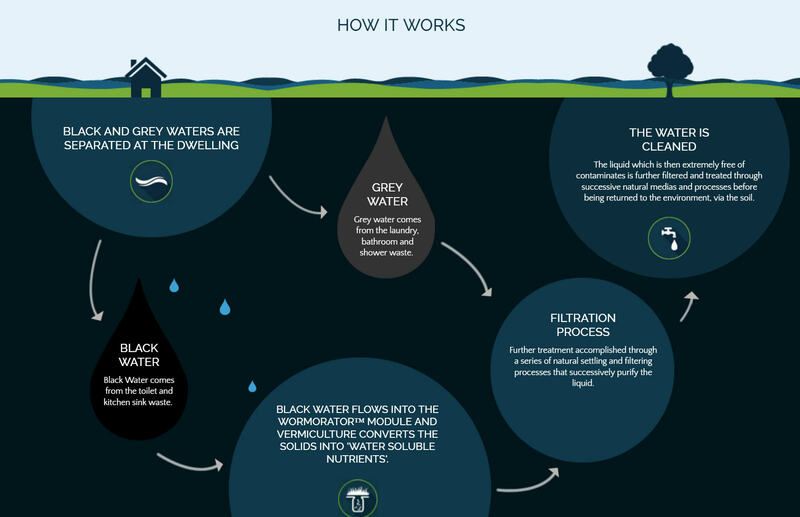 Natural Flow basically separates the grey water (sinks, washing, shower etc) from the black water (you know what). The black goes to our family of tiger worms (the same breed who will be dining out on our hungrybin compost solution), they do what they do best, and then the liquid merges with the grey water and via a gravity system, goes out in drip lines across our horticultural area…apparently lemon trees do particularly well. I really like the idea that if there’s a power cut, we can still use our toilet as there are no pumps required. Just call it being prepared is all. This system does mean that we need to be careful about what chemicals we use, and has built a great business case for investing in a self cleaning pyrolytic oven so I never need to clean an oven again. What I call a win-win.